Political, Sexual Abuse, Stories, Theology, Welcome to our home! The above Washington Post photo suits my purpose perfectly. I missed a Women’s March in the early 1980’s. I did not realize the significance of the event until it was over. As best I remember it, I went to class that night at Arizona State University. A more important educational experience was taking place in the streets of a Phoenix suburb. While working on my Masters of Counseling Degree, I was a volunteer and four-hour-per-week data analyst at the Center Against Sexual Assault (CASA). I was one of two men working there with a dozen or more women. It was a job which transformed into a lifetime mission of moral and legal justice for survivors and fatalities of childhood sexual abuse (CSA). At the time, many of the staff were involved in planning a Take Back the Night march when a nearby mayor did something significantly unenlightened. Two serial rapists were stalking their prey in his community, and the mayor decided to wade in with an executive order. He established a nine-o’clock curfew for women to be off the streets, for their own safety. His timing could not have been more appropriate to the feminist cause. Women came out to march in what was then considered great numbers. I learned about the protest later from my co-workers. The organizers started the march in the mayor’s community nine o’clock at night. 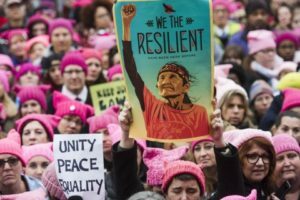 The gathering was comprised of women from all races, religions, educations, classes, ages, incomes, gender identifications, and sexual orientations. The peaceful protesters not only united and came out against the female curfew, they demanded a male curfew. After all, who was making the streets dangerous, the women?! missed that shared consciousness since my wife passed away three years ago. I still miss Carol, but I am no longer alone with my convictions. I have discovered recently, at sixty-four years of age, a cadre of dedicated and passionate kindred spirits. I found them in the Ph.D. program at Prescott College, Arizona. After much time quietly standing back and closely observing our nation’s political season, I have decided it is time for me to declare where I stand. This past weekend I found my political tribe. I do not enter this commitment blindly. I have issues to debate with some of the members. However, we are confronted with what I believe may be the bleakest challenges in American history. I believe the most visionary, prophetic, and moral group available to me has been called together in the Women’s March on Washington. I now join my peaceful warrior sisters, daughters, mothers, grandmothers, and brothers with gratitude and humility. I stand with women and men all around the world. That indigenous person in the photo with her raised and closed hand expresses solidarity. She represents me. I am there with her and the rest of those women. I embrace our cause.